Cycling is by far the fastest, most efficient and most enjoyable way to get around London. What's rather less pleasant is walking away from an expensive bike at the end of a ride and hoping it'll still be there when you get back – which is where folding bikes come into their own. There are folding bicycles that are pleasant to ride. There are folding bicycles that fold down into a very small space. And there are folding bicycles which fold quickly & easily. If you want all three, however, there is only one choice. The Brompton has become the Default London Bike – and with good reason. Hop on when you want to ride it, hop off when you arrive and 20 seconds later you have something that you can put under a desk, take into a restaurant or jump straight onto a train. Once you get home, it takes up next to no space in even the most compact of London apartments. After downsizing from a recumbent trike plus Brompton, I decided to ask Ben Cooper of Kinetics fame to create the ultimate Brompton. 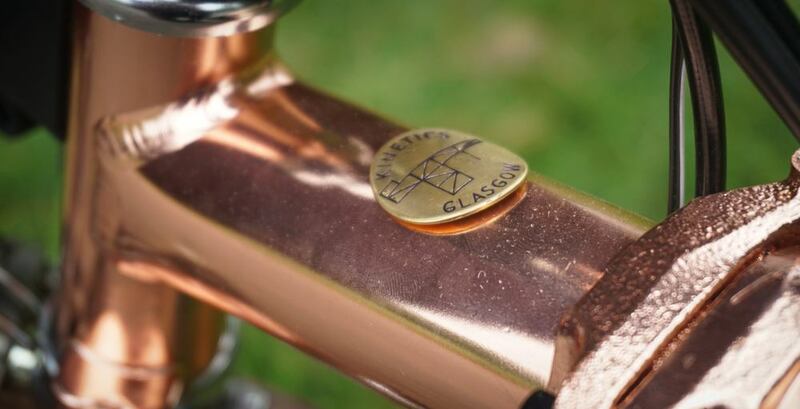 Copper is the most beautiful of all metals to me, so frame, forks, stem and rear triangle are all copper-plated. I decided such a beautiful finish had to be matched with the finest mechanicals available, so opted for a Rohloff hub. 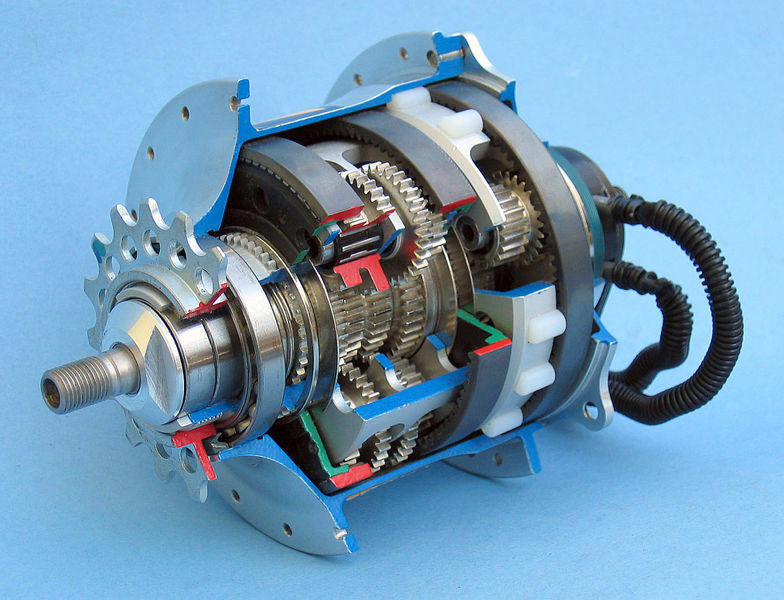 My previous 8-speed Sturmey Archer was great: wide-range, close-ratio gears, the ability to do any number of shifts while stationary (great if you hit red lights while in a high gear – and a slick twist-grip shifter. The Rohloff offers all of that plus internal indexing (no adjustment ever needed), perfectly even 13.5% steps between gears, virtually zero maintenance (just an oil-change every 3000 miles) and a reputation for being bomb-proof. 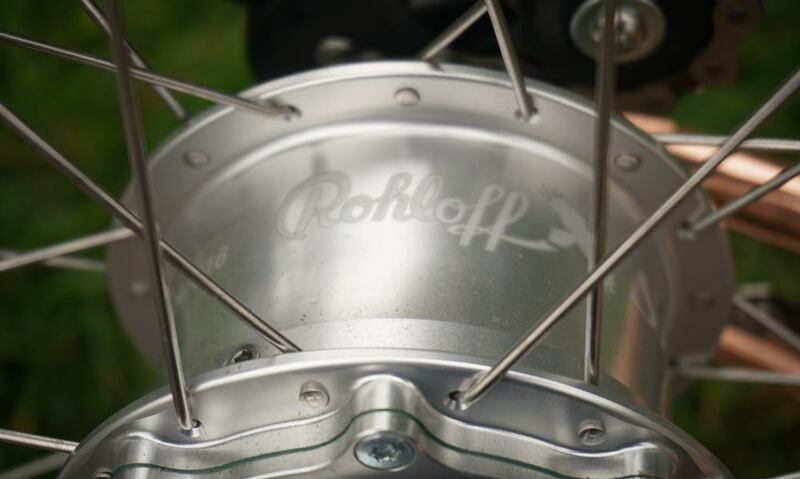 Rohloff says that in ten years of production, and 30,000 hubs made, they have never seen a single failure – including bikes that have done 40,000 miles. Twist-grip shifters require the S-bar, which I find a little low, so we opted for riser bars. 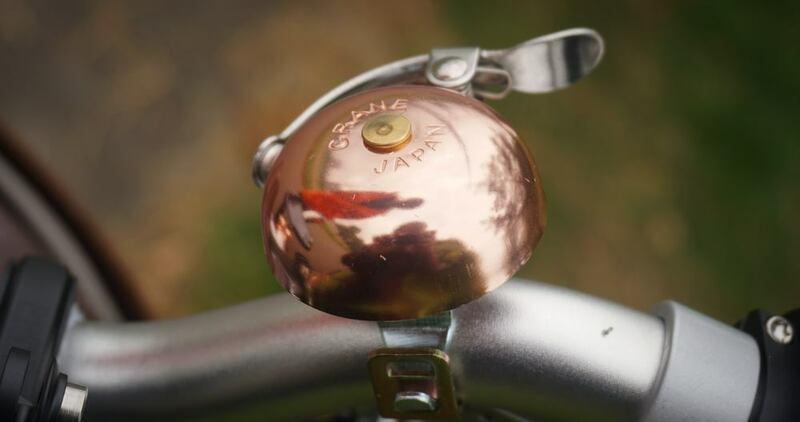 There was never any question about the saddle: Brooks B17 Special, with copper rivets. 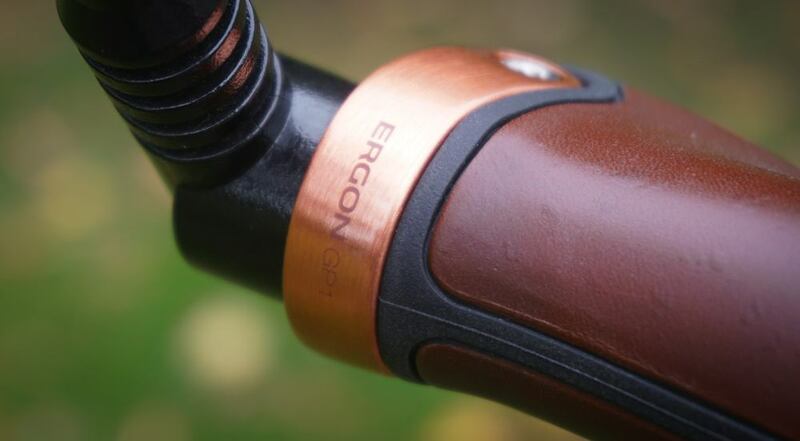 Likewise for grips, it was always going to be Ergon – the only question was which ones. I had cork ones before, but this time went for the Brooks leather version – in brown, to match the saddle and bag. 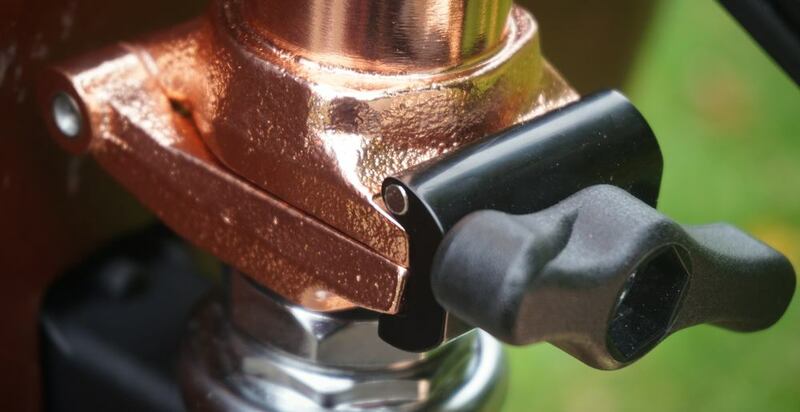 Brooks bizarrely pairs the brown grips with silver ends and black grips with copper ends. Fortunately, my girlfriend wanted black and silver, so we just swapped the end-pieces. 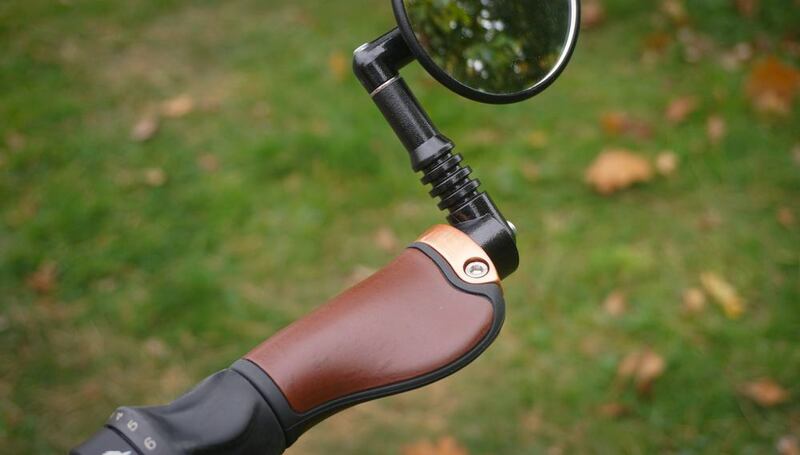 The rear section takes the weight of your hands, enabling a light grip on the bars, and making them very comfy. I of course needed to have a matching copper bell, so swapped my brass Lion one for a Crane. Lighting was also never in question. I adored the SON hub dynamo on my previous bike, retaining the hop-on, hop-off convenience at night as well as in the day. You only really appreciate the joy of never having to think about charging lights – or even switching them on – once you've experienced it. Some opt for the Sensor mode, so the lights come on automaticallty in the dark, but I leave mine on all the time. Riding with the lights on adds just 4% drag, and makes you a lot more visible in the day, especially to traffic waiting to pull out of a junction. 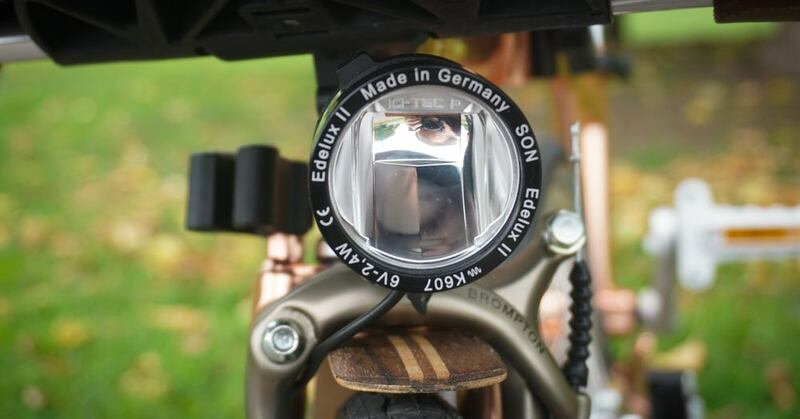 I opted for the more powerful Edelux headlight. You can see here also a glimpse of the gorgeous Proou wooden mudguards. There are a number of wooden mudguards around, not all of which are high-quality, but these are the real thing. I use my Brompton year-round in all weathers, so mudguards are essential, but there's no reason they can't be pretty. The obligatory GPS is a Garmin Edge 1000, which offers a larger screen than the 810 it replaced. 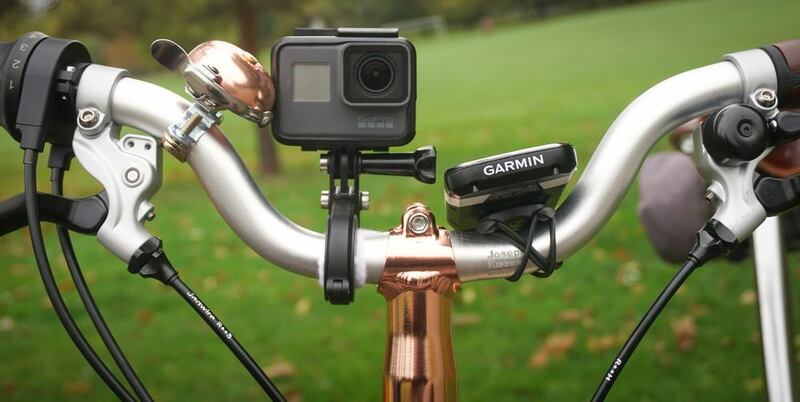 My bikecam is a GoPro Hero 5. 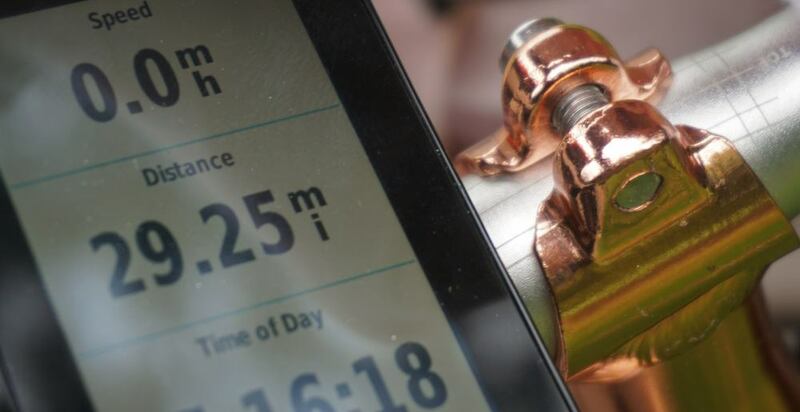 I use this to capture footage of fun rides, and I also run it permanently when commuting. I find that I'm much more relaxed about idiotoc drivers if I know that I can embarrass them on YouTube or report them to the police if desired. I've only ever done this once, but the knowledge that I can means I can immediately let stuff go, so it's worth it for that alone. 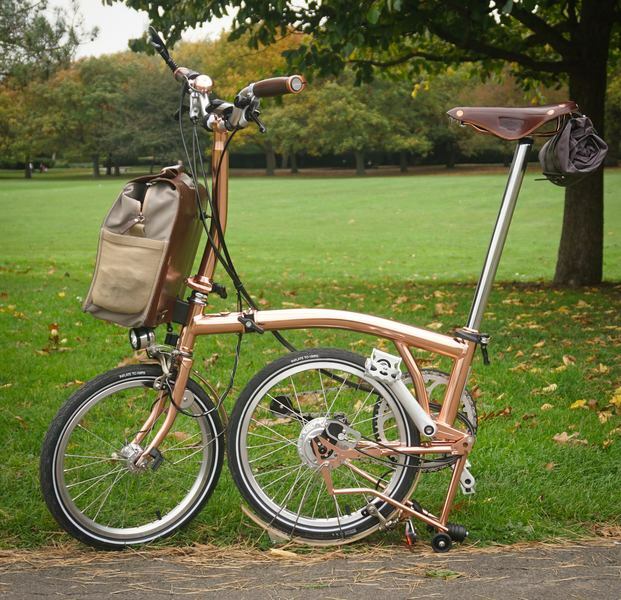 The Brompton itself is almost perfectly designed, but there are two areas where it falls very slightly short. The first are the hinge clamps in that very clever fold mechanism. These can spin round, adding as much as 1.5 seconds to the fold time. This is clearly unacceptable. I tried Brompfication hinge-clamps before, but they bend over time, so went instead for magnetised versions of the standard ones – the magnets automatically aligning them. The small wheels designed to allow you to wheel it along when folded are a little too small. I have some 60mm luggage wheels on order. If you own a Brompton and fancy social rides with other Bromptonauts, you might want to join the London Brompton Club.